A telephone call came through from the curator’s office at Guildhall Art Gallery. 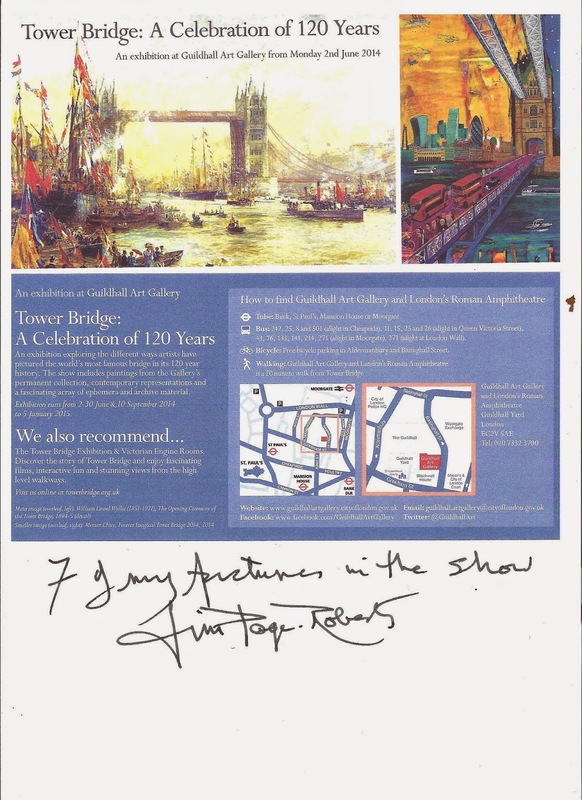 The curator, Julia Dudkiewitz, was forming an exhibition of pictorial depictions of Tower Bridge since its inception and had wanted to show my large 1954 painting of “Tower Bridge from Bermondsey Wall” that happens to be in the National Collection. She discovered that it hangs on a wall in some far-flung Embassy. Thus, it was unobtainable. So could she come around to see if I had anything else that might be suitable to show. Margreet and I rummaged around and found a large self-portrait, done in 1965, made up of dockland shapes – the funnel of the Dollar Bay tug, smoke and steam coming from it, wharves, quays, and a marker buoy. In the background, as the distant focal point, is a rather freely painted Tower Bridge. The curator looked at it and declared that she had seen many, many paintings in her life, but not one like this. There were also one or two later “Landscape Recalled” pastel depictions of the bridge that she liked. As well, records were held somewhere of other bridge paintings by me - ones sold at Christie’s and through Offer Waterman Gallery. These she would try to track down and borrow. The exhibition will be held at Guildhall Art Gallery throughout the month of June 2014, and I am to cut the opening ribbon. That was the blog that I wrote before the exhibition opened. For this major exhibition, I had rather rashly agreed to give an opening speech before cutting a ribbon. Now it so happens that I have managed throughout my life to avoid speaking in public. So, for my first, and I hope last effort, I decided to speak “off the cuff”, but with practice and without notes. Night and day I practised my piece, altering it, extending it on request, and getting more and more nervous. I longed for the speech to be over and done with. I could then sleep without the words running through my head. As for cutting the tape, I planned to hold on to one bit, snip a piece off, and keep it as a souvenir. Then I heard that the tape bit had to be abandoned, due to some “health and safety” aspect. Perhaps they did not trust me with a pair of sharp scissors. The evening of the 2nd of June 2014 arrived. I was offered words of assurance by friends as we waited in the grand courtyard. Then inside, a drink, and an opening address given by an important and professionally practised dignatory. My turn came. If I got the first few words out, I thought that the rest might follow. And they did. I spoke about my rather vinous experiences of drawing in the 1950s and 1960s dockland, thanks to a wonderful pass given to me by The Port of London Authority. I was now on autopilot, and what I said seemed to make people listen and laugh. Then I stumbled, forgetting what I was to say next. I suppose it made me more human. No one seemed to be concerned – except me. Then it was over. And seldom have I enjoyed a drink more than the one thrust into my hand. The Exhibition in this splendid Guildhall Art Gallery has turned out to be a wonderful one – full of interest, from sepia photographs of the bridge under construction in 1894 to a work so new that its paint may well have not yet dried. My own contribution was well presented by the excellent curator, Julia Dudkiewicz. And it was particularly pleasing to me that those who had liked my painting and had bought directly from me, through Christie’s, or Offer Waterman Gallery, and kindly lent them to the show, were able to see their possessions on view to all. The magnificent catalogue, reproducing all the work in colour, is a work of art in itself, a fine memento, and a reference vehicle for those studying the history of one of London’s, and the world’s, iconic structures.